There where tense moments last night, as Simonas Steponavicius' Volvo 60, Ambersail made a dash for the finish line of the Sevenstar Round Britain and Ireland Race. They were desperately close to taking the overall lead on handicap. The Lithuanian Volvo 60 passed St. Catherine's Point on the south side of the Isle of Wight just before midnight, averaging 13 knots. They knew that if they could keep up that speed, they were going to take the overall lead. Turning downwind into the Solent at Bembridge Ledge, the breeze started to fade a little and with that their hopes of an overall win. But the Lithuanian team has performed magnificently in a yacht that is ten years old. The team all sail at Klaipeda, on the Baltic Sea. The yacht was purchased in 2009, to commemorate a thousand years of Lithuanian history. 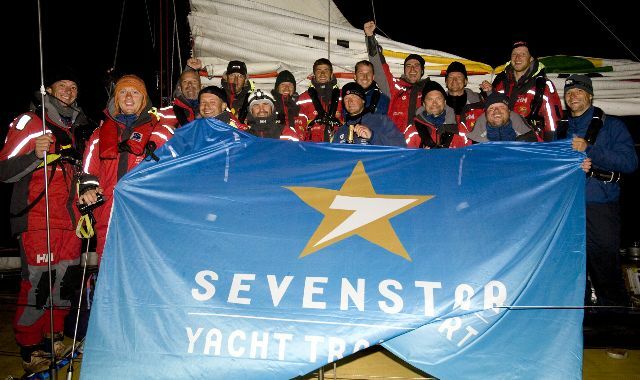 The crew sailed the boat in nine legs around the world and the Sevenstar Round Britain and Ireland has been something of a reunion for the crew. No doubt they will have an extensive celebration in Cowes today but they will s hortly be sailing the boat down to Malta to compete in the Rolex Middle Sea Race. At 0700 BST, Piet Vroon's Ker 46, Tonnerre de Breskens was 142 miles from the finish, going upwind at eight and a half knots. If they can keep up that pace, they should finish the race by 0100 tomorrow morning. They will be hoping that the breeze will hold out during the day. For the moment they are on course to eclipse Artemis Ocean Racing's corrected time and take the overall lead on handicap in the Sevenstar Round Britain and Ireland Race, but it is going to be very close. At 1500 BST the wind across the racecourse had gone to the northeast and patchy with large areas of no wind at all. Simonas Steponavicius' Volvo 60, Ambersail was 151 miles from the finish, heading inshore presumably to take advantage of the tidal race at Portland Bill. The Lithuanian boat was achieving over eight knots but need to average over 14 knots to take the overall prize. 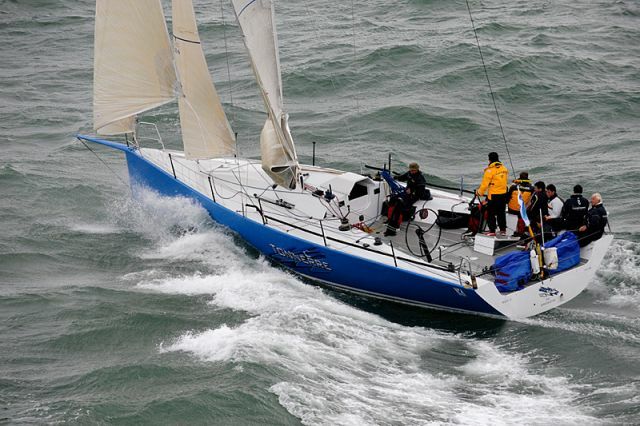 John Merricks II was around Land's End with 195 miles to go; they need to average nearly 17 knots to beat the corrected time of the current leader. Earlier today Luke McCarthy, skipper of John Merricks II had this to say from on board: "We have just passed Bishop Rock and we have had a sweepstake on when we will finish: 1100 to 1800 hours tomorrow is the spread. It looks as though we will have yet more upwind work to do for the last leg of this race. The beat up to Muckle Flugga really took its toll on the boat and crew, and we have hardly had the spinnaker up at all since we passed Dover all those days ago. The British Keelboat Academy was well prepared for this race, but we could definitely have waterproofed the boat better; there are a few trickles from deck leaks, but the occasional torrent of water coming down the companion way, makes life pretty unpleasant down below, as well as on deck." IMOCA 60 Artemis Ocean Racing have set the benchmark for the overall winner on handicap honours and it looks like it could go to the wire. At 0800 BST Lithuanian Volvo 60, Ambersail had 143 miles to go and were achieving a speed of seven and half knots. If they continue at that pace, they will finish at about 0400 BST. To beat Artemis Ocean Racing, they have to increase their speed and finish by 0144. However, the British Keelboat Academy's TP52, John Merricks II had 239 miles to go at 0800 BST and are also in with a chance of claiming the overall prize. But, as a ridge of high pressure from the west comes across the race course, the breeze is set to fade, which may alter things dramatically. 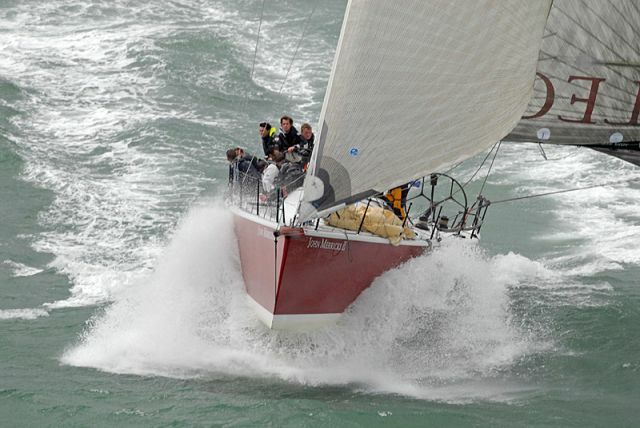 At the moment, Piet Vroon's Ker 46, Tonnerre de Breskens is the handicap leader and favourite to take the race win. Boat Captain, Matt Trautman called in as the boat went around the Fastnet lighthouse last night: "We had an amazing run down the west coast of Ireland with full main and the A3 up we were really trucking along; 24 knots was our top speed. Now things have gone a little lighter, but we still have 14 knots of wind and we are making good progress. One problem on board is the cooking, we have no gas! We are living off cold rations and biltong. We expect to finish around midnight on Tuesday, just before crewman Frank Gerber's birthday. His mother runs the King and Queen pub in Hamble and has promised us some steak sandwiches, which is a real incentive to keep the boat speed up!" To win overall Tonnerre must finish by 0154 on Wednesday so it will be a close cut thing. "The low point was having a fitting break at the top of Scotland that prevented us using our heavy weather jib for 10 hours. This allowed Groupama to get from 20 miles behind to 30 miles in front – heart breaking from a racing point of view but the sort of price you pay in these type of racing boats when things break. When the failure occurred it was pitch black (as it always is when things go wrong!) and blowing 35 knots in a horrific seaway. But after that, it was fantastic sailing in flat water, something I’ve never experienced before around Scotland. The fastest part was just off the back of the Isle of Wight and these boats are great to sail, they’re just a big skiff. 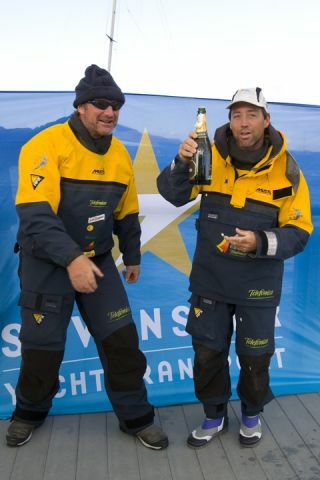 The Sevenstar Round Britain and Ireland was a really fantastic race."